Are you starting or running a nonprofit? 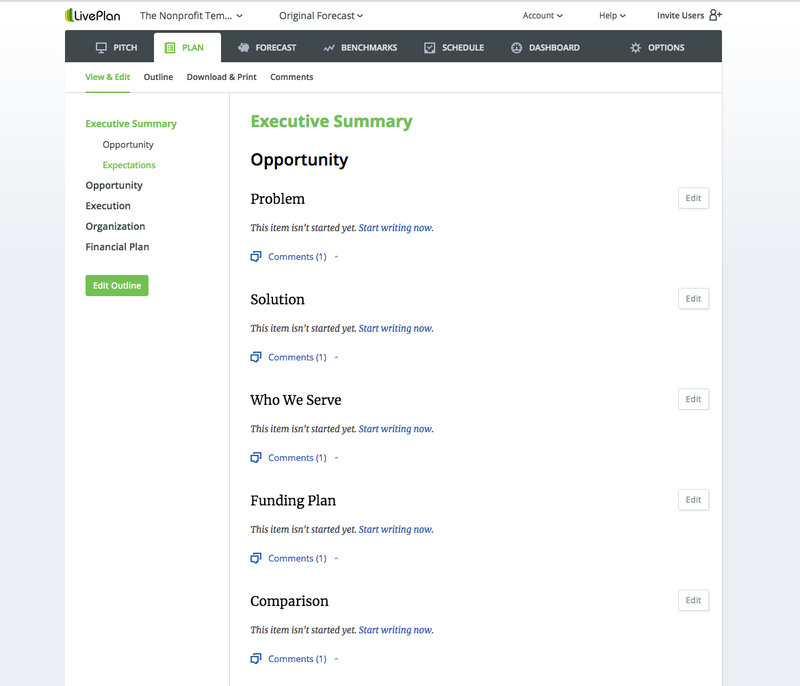 Whether you’re already using LivePlan or doing some research to find the right software for your tax-exempt organization, it’s natural that you’ll have some questions about how LivePlan might be able to help you write your nonprofit business plan or strategic plan. But did you know that LivePlan also makes it easy for nonprofits to track their projected financials against their actual income and expenses in real time? Plus, LivePlan financial reports are easy to read and share with your board of trustees. Nonprofits need good business planning and access to real-time financial information as much as (and sometimes more than) for-profit businesses. Whether your goal is running neighborhood food pantry or starting a nonprofit law firm, good business planning is about management, accountability, tracking performance metrics, and improving over time. Even when your goal isn’t to increase profits, you still need to be able to run a fiscally healthy, mission-driven organization. With LivePlan, you can create a “living” financial plan for your organization on a three to five-year basis, with the option to include up to three years of monthly details. This means that you can use it as a real-time financial dashboard (more on that later), so you’re never left wondering where you stand. 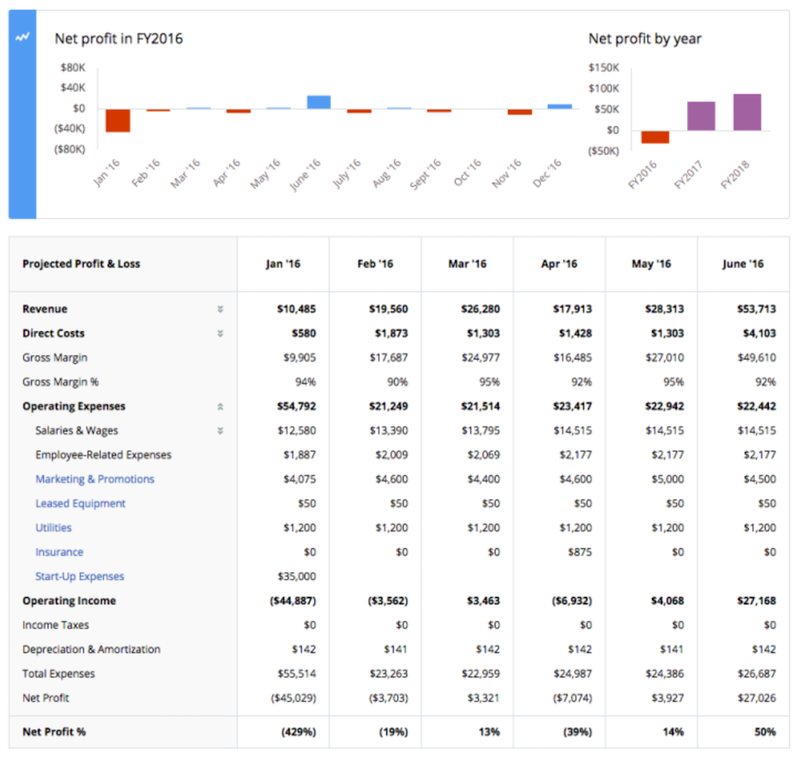 If your nonprofit uses QuickBooks Online or Xero as your accounting solution, you can connect that LivePlan, so when you’re looking at your budget and cash flow, you can seamlessly compare actuals with what you projected without any data entry. Because you can track your financials in real time and generate key financial statements, it’s easier to stay on top of opportunities and challenges. For instance, if your organization has a surplus of funds because you didn’t spend some of the money you budgeted for a particular initiative, it might be appropriate to funnel it back into program costs and administration. Likewise, you can use the LivePlan business Dashboard to help you quickly identify shortfalls well before they balloon into a budget crisis. Even if your main cash sources are from grants or fundraising, there are still variables that can affect your cash flow that can have a serious impact on your organization’s viability if you’re not paying close attention. Just like for-profits, your organization has salaries to pay and overhead to cover to keep the doors open and provide services. Planning for the basics and then setting your sights on future achievements will help ensure the sustainability of your venture. LivePlan lets you keep track of it all in one place, so you can keep doing what you love well into the future. 1. Edit the LivePlan business plan outline so that it includes the chapters, sections, and titles that are most applicable to your organization. You can also remove an unwanted section or add an entirely new one. Want to change or remove the word “Company” from the plan outline? Go right ahead, just click edit. We’re also testing a beta-version of a LivePlan template that’s specifically for nonprofits; if you’re looking for a planning experience that’s already outlined and tailored to nonprofits, just contact us and we’ll install the nonprofit template on your LivePlan account. How is the nonprofit template in LivePlan different from the regular business template? For instance, instead of showing a Profit & Loss table, it’s renamed to Surplus & Deficit. The template also includes a chapter to describe your fundraising plan, rather than sales plan, and a chapter to provide an overview of your the demographic your organization serves, rather than the traditional for-profit market analysis. You can see the outline on the lefthand side. 2. Create a polished slide deck for your trustees and prospective donors. LivePlan’s Pitch feature makes it easy to put together a presentation-ready slide deck on your organization and programs, your financials, and your leadership team or partners. When you’re finished creating it, export it to a file that you can open in Powerpoint or Keynote. Or, you can publish it as a private webpage, so it’s on hand whenever you need to give a presentation. LivePlan makes it easy to add “partners” (members of your nonprofit leadership team and board of trustees) that could benefit from login access to your plan. But for the rest of your team, or for certain donors or grant applications, you can also download and share your plan as a Word doc or a PDF. 4. Receive a 30 percent off discount for monthly LivePlan payments when you provide us with your nonprofit tax ID number or EIN. Putting together your annual budget can be tedious and time-consuming. Even after you and your team have thought through and agreed on an initial budget, you’ll need to take it to your board of trustees for final approval. Then, throughout the year, you’ll probably update your trustees on your financial progress. Reviewing lengthy, printed budgets full of individual items in tiny text can be a distraction during meetings. It can derail what should be macro-level conversations with side tangents around unimportant details—things that are best managed by your team on the ground, rather than by consensus in a board meeting. What looks like being 30 percent over budget on office supplies could indicate something as basic as needing to purchase a new computer monitor a few months prior to when it was officially budgeted. It’s probably not a cause for concern. Putting this level of minutiae in front of your board can be confusing and distracting from real challenges that you need your board to help you address. But you still need to communicate with them about your financials. To keep meetings on track and give board members the information they need to make informed decisions, a higher level view of the budget is a better fit. A sample view from within LivePlan of revenue and expenses. We know that most board members take their responsibility to your organization very seriously when they accept a seat. They have a vested interested having insight into and oversight of your organization’s financial plan. LivePlan gives you a tool for giving them the right amount of access—it’s user-friendly and straightforward. With LivePlan, you can group areas of your budget together, show expenses by month and by year, and then give the board members LivePlan “guest passes” so they can review your budget right in the software at their leisure and, if they need to, leave questions or comments. You control how much access you give guests to your full nonprofit business plan in LivePlan. You can also create PDFs and print your financial reports right from the LivePlan Dashboard. The LivePlan financial Dashboard is a great tool for tracking for financial goals as they relate to fundraising and generating program funds, and comparing them against the reality of what you’ve raised and spent. The Dashboard is most useful when you sync it with your QuickBooks Online or Xero accounting software, though it is possible to add that data manually. It has many practical applications for nonprofit use, not the least of which is a clear visual on how much of your income is being spent on programs and services, versus what you’re spending on administrative costs or overhead. If you can see how things are shaking out financially, you can easily and quickly make adjustments as you go. This type of data is critical to nonprofits since the percentage of an organization’s money that actually goes to its programs and services is public knowledge through your form 990 filing—manage your reputation and your agency’s focus before it’s time to file. In summary, LivePlan can help you streamline your strategic planning and financial management. It makes it easier to provide your board of trustees and other supporters with the right level of transparency and easy to read and understand financial documents. It’s possible to track your financials and generate reports manually, but LivePlan can help you free some of your time and focus, so that you’re prepared to respond when you have challenges or see opportunities to expand your reach. Are you using LivePlan to further your nonprofit success? Tell us about it on Twitter @LivePlan! Editor’s note: This article was originally published in November 2015. We updated it in May 2018.